Philippine National Record Holder Patrick Unso of DLSU will undoubtedly be the main attraction at the UAAP. The 19 year old Unso may have only finished 6th at the South East Asian Games. But very rarely do we see at the UAAP an athlete who has achieved the rare feat of holding both the National and Junior National Record in a said event. Unso time of 14.58s broke the 14 year old record of Army man Alonzo Jardin (14.75) and also his own National Junior Record. Unso who competed for UST High school and set several junior uaap records along the way missed the last edition of the UAAP due to residency (must be at the school for 1 whole year before competing during UAAP). In his absence older brother Jose Unso claimed his first title in the 110m Hurdles in a time of 14.7s (hand timed) but was probably just happier to be in the 14 second club. Now with electronic timing Jose’s goal is perhaps to officially be in the 14 second club. An interesting event looms ahead as the two sons of Phi T&F legend and 400m Record Holder Renato Unso do battle at the UAAP grounds. However the odds are probably stacked more on the side of the younger Unso and the 14.96 record of Orlando Soriano of FEU is expected to disappear. Maybe very fortunate that last year Jose Unso was able to claim the title in his brothers absence as he will have a tougher job this year of defending his title. Undoubtedly chasing the Unso brothers is one of the most highly competitive fields in UAAP History in this event. 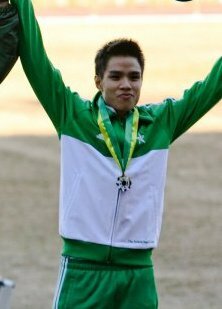 Emmanuel Delos Angeles of UST who has a personal best of 14.8 seconds and claimed the silver at last years UAAP. After defeating Jose Unso during all there encounters at the weekly relays was the fancied favourite going into last years event and who knows could cause another upset or split the two Unso’s on the podium. FEU Jesson Ramil Cid last years silver medalist has been highly consistent running low 15s but is yet to break into the 14 second club. Even though he is still participating in alot of individual events and the two relays, he does not have the draining experience of the 10 event decathlon so will be a formidable force in all the events he has opted to do. The Womens 100m Hurdles will be another event in which the defending champion will struggle to retain her title. The indication of this is the University Games in November where the results were as follows. The inform athlete is Thea Santos of Ateneo, the third of the three famous Santos sisters (Mika PV Sea Games, and Marla multi events and jumps). Thea took an incredible .6 seconds off her personal best, and scalped some athletes such as Palmares who only a few months before had left her far behind at the Palarong Pambansa. This event is probably the most competitive event of the entire UAAP. However on PB shape Vienna Mae Banebane of UST the defending champion has the best time of 15.0s, followed by Aleah Gatmaitan of UE who won silver last year 15.1s, Michelle Palamares the Palarong Pambansa and Milo Little Olympics champion for the last 2 years now at UST 15.2s, aswell as this Katherine Costan of UST 15.5s, and Lea Casilihan of DLSU. The event has easily 6 of the top 10 hurdlers in the country. Another interesting thing to note is that UAAP Santos, Palmares, Casihan and Costan will be squaring off against Jaycel Casabuenca in the Junior Division at the National Games in Dumaguete May 27-June 3. This entry was posted in 05 UAAP News and tagged 110M Hurdles, Aleah Gatmaitan, Alonzo Jardin, asian athletics, Athletics, Banebane, Dumaguete, Emmanuel Delos Angeles, Hurdler49, Jaycel Casabuenca, Jesson Ramil Cid, Jose Unso, Katherine Costan, Lea Casilihan, Michelle Palmares, National Games, National Record, Orlando Soriano, PATAFA, Patrick Unso, Philippine athletics, philippine sports, Philippine track and field, philippine track records, Renato Unso, Thea Santos, track and field, UAAP, UAAP athletics, UAAP track and field, UST track team, Vienna Mae Banebane. Bookmark the permalink.